An Inventory of Living and Working conditions, 1861. With its large portfolio of investments, the Scottish Australian Mining Company sought to make each of its properties productive. Thus, from June 1899 onwards, the Company was seeking to work or dispose of the Cadia Properties on reasonable terms. Each major find at Cadia had led to other resources. Thus the company had turned from copper to gold in the 1870s. The search for a mother lode had resulted in the discovery of more copper, exploited from 1887-1891, pointing to the iron ore resources of the Iron Duke. In 1899 the company decided to pursue the potential of this resource. In September 1900, Mr. Jaquet, surveyor to the Government Geologist, reported favourably on the iron ores between the old Canoblas Mine at Little Cadia and the much larger deposits at the Iron Duke. Although the company proceeded with negotiations with William Sandford Limited at Lithgow, these were brought to a standstill by proposed amendments to Commonwealth legislation that would have favoured a state run steel industry. The NSW Government called for tenders for the supply of iron and steel in 1905, with William Sandford Limited, Lithgow, being the successful tenderer. It was not until 13 may 1907 that the Premier of NSW officially commissioned the blast furnaces at Lithgow. The lease of the Iron Duke was confirmed by November 1907, but required the construction of the branch line from Spring Hill to Cadia to be completed before operations could commence. In the meantime, Charles Hoskins of Hoskins Brothers purchased the steelworks from William Sandford in December 1907. It was not until 1908 that the Commonwealth Government passed the Iron Bonus Bill, therefore making it easier for the establishment of an Australian iron and steel industry. Lithgow came to be known as the Birmingham of Australia as a result of its industrial development. The Lithgow Valley Iron Company, commenced in 1875, was taken over by William Sandford in 1886. He commenced steel production in 1900, building the first modern blast furnace in 1907. Hoskins Brothers purchased the Lithgow Steelworks in 1907 and built the second blast furnace in 1913. 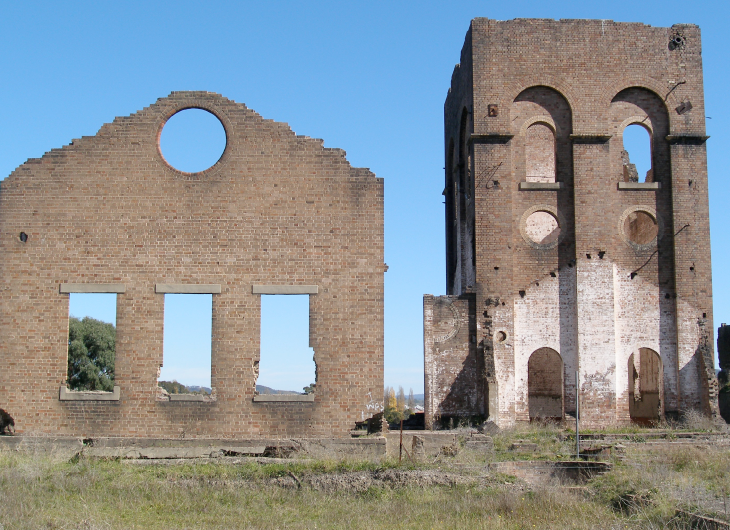 The ruins of the Davy (right) and the Ferranti (left) Engine Houses are the most impressive ruins surviving today. The Hoskins Brothers exploited a number of iron ore quarries, including the Iron Duke at Cadia (Edward Higginbotham, 2007).